Art Radar Asia was recently sent information on an event new to the art promotion circuit – VIP Art Fair is the first fair to be run entirely online. The event will launch on 22 January, 2011 and was founded by experienced art professionals James and Jane Cohan from James Cohan Gallery and Silicon Valley-trained technology and marketing specialists Jonas and Alessandra Almgren. The fair will be free of charge and 45 international galleries have already signed up. Standout features include a VIP Lounge where special films of private collections and artist studios will be available to view, interaction between buyers and dealers through Skype and instant messaging, and a function which will allow fair attendees to take tours of the virtual gallery including the ability to zoom in on artwork detail. A snapshot of a VIP Art Fair gallery page. Image courtesy of VIP Art Fair. HONG KONG, August 19, 2010 – VIP Art Fair, the first art fair to mobilize the collective force of the world’s leading contemporary art galleries with the unlimited reach of the Internet, announces its inaugural fair taking place exclusively online for one week only, January 22-30, 2011, at www.vipartfair.com. An unprecedented event, VIP Art Fair gives contemporary art collectors access to artworks by critically acclaimed artists and the ability to connect one-on-one with internationally renowned dealers—from anywhere in the world and without leaving home. VIP Art Fair Founding Galleries David Zwirner (New York), Galerie Max Hetzler (Berlin), White Cube (London), Gagosian Gallery (New York, London, Beverly Hills, Rome, and Athens), Gallery Koyanagi (Tokyo), Hauser & Wirth (Zürich, London, and New York), Anna Schwartz Gallery (Melbourne and Sydney), Xavier Hufkens (Brussels), Fraenkel Gallery (San Francisco), Kukje Gallery (Seoul), Sadie Coles HQ (London), and James Cohan Gallery (New York and Shanghai) will be joined by other international contemporary galleries. A partial gallery list is now available online. A complete list will be made public this fall. The revolutionary design of VIP Art Fair allows art collectors the opportunity to view artwork online as never before. VIP Art Fair’s innovative technology presents artworks in relation to other works of art and in relative scale to the human figure. Inquisitive visitors can zoom in to examine details of a painting’s surface, get multiple views of a three-dimensional work, and watch videos of a multimedia piece. Galleries will provide comprehensive details on artworks and artists, including biographies, catalogue essays, artist films and interviews, and in-depth information that will empower collectors. One of the many distinct features of the Fair is the interactivity between dealer and collector. Each dealer has the ability to hold conversations with collectors via instant messaging, Skype, and telephone to discuss works on offer in the virtual booth. Dealers can also provide access to their gallery’s back room inventory, sharing works in real time with clients in specially-created Private Rooms on the client’s own computer screen. There are many ways to explore the Fair, including online tours which are core to the VIP Art Fair experience. Visitors to the Fair can choose from a wide selection of tours—whether of featured works or a tour created by collectors, critics, and curators from participating museums. Visitors also can design their own personalized tours of the Fair that showcase their favorite works and can be shared with friends or posted in the VIP Lounge. Other ways to navigate the site include the Fair Map and advanced searches based on criteria of interest, such as artist’s name, medium, or price range. The VIP Lounge is where visitors can watch specially commissioned films of leading private art collections and artists’ studios, check out Fair tours created by other visitors, access status updates on art market news, and learn about new works on view in the Fair. The Fair will open on Saturday, January 22, 2011 at 8:00 a.m. EST and conclude on Sunday, January 30, 2011, at 7:59 a.m. EST. Browsing the Fair is free of charge. To access interactive capabilities, visitors must have a VIP Ticket, which on January 22 and 23 will cost $100 and thereafter will cost $20. Visitors are encouraged to register in advance. It seems the international art community is divided in its opinions regarding the success of online sales of artworks. However, Saffronart, a constant pioneer of new technologies in the art auction arena, recently introduced a mobile phone bidding application to it’s seasonal auctions. With increasingly more mobile ways to access the Internet and new features which allow users to better explore and interact with virtual space, such as those that will be presented at VIP Art Fair, it’s hard to tell if this is a fad or the first successful move into better utilising this new sales territory. What do you, our readers, think? 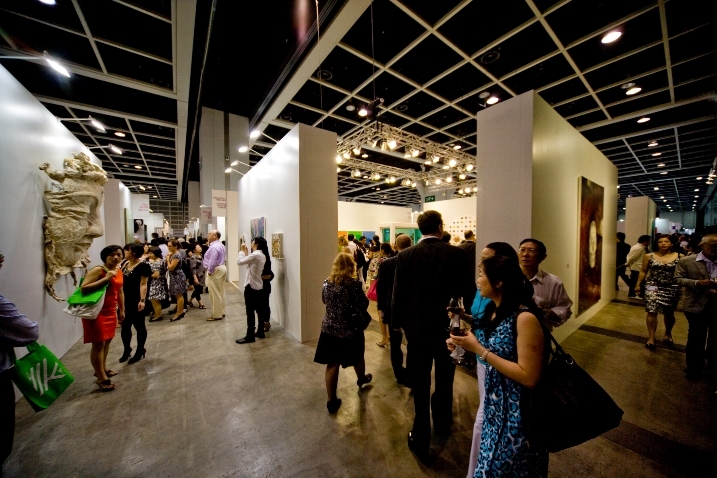 ART HK 10 was reportedly more festive than the ’09 edition due to its increasing ability to attract more high-profile and experienced collectors and curators from round the world, indicating its growing importance in the contemporary art arena of Asia. ART HK 10 attracted many new comers this year. Who were the collectors attending ART HK 10? This year, the art fair attracted high-profile collectors from China, Japan, Taiwan, Korea, Indonesia, Singapore, Australia, across Europe and the United States. They included Thomas Shao and Li Bing (China); Sir David Tang and Monique Burger (Hong Kong); Richard Chang (New York); Dr. Gene Sherman of the Sherman Contemporary Art Foundation and Judith Neilson of the White Rabbit Foundation (Sydney); Susan Hayden and Nigel Hurst, Director of the Saatchi Gallery (London); and Sydney Picasso and Diana Picasso (Spain). Some of the world’s most influential museum directors also attended the fair. They included Richard Armstrong (Director of Guggenheim Museum); Michael Govan (CEO and Wallis Annenberg Director of Los Angeles County Museum of Art); Joseph Thompson (Director of MASS MoCA); Olga Viso (Director of Walker Art Centre); Elizabeth Ann MacGregor (Director of the MCA in Sydney); and Jock Reynolds, (Director of Yale Art Gallery). The fair also attracted specialist Asian curators such as Alexandra Munroe (Senior Curator of Asian Art at the Guggenheim), Maxwell Hearn (Douglas Dillon Curator at Department of Asian Art in Metropolitan Museum of Art), and Jan Stuart (Head of Asia at British Museum). Some renowned curators attended an ART HK 10 talk organised by Asia Art Archive. They were Shinji Kohmoto (Chief Curator at the National Museum of Art in Kyoto), Yuko Hasegawa (Chief Curator at the Museum of Contemporary Art in Tokyo), Yukie Kamiya (Chief Curator at the Hiroshima City Museum of Contemporary Art) and Barbara London (Associate Curator at Department of Media and Performance Art in the Museum of Modern Art in New York). The significant increase in the number of experienced collectors and curators coming to the event was the result of an expanded scale and an improvement in the of quality of the art being sold and displayed. On the other hand, the improved quality of galleries may also be indicative of the sophistication of art in Asia. Art Radar Asia was determined to hunt down first-hand perspectives of galleries in attendance this year and spoke with 19 during ART HK 10. Reactions to the fair were as varied as the galleries we spoke with. Read what they had to say here. Strong sales figures have been reported since the third Hong Kong art fair drew to a close in late May this year. Million dollar sales of artwork by Zhang Xiaogang and Damien Hirst, plus high-priced sales of works by Anish Kapoor and Yoshitomo Nara, suggest the event is now able to comfortably position itself as one of the world’s top art fairs. “It’s our second time at the Fair and sales this year are up 100%. We sold to collectors from Japan, Taiwan and Beijing. I think the fair has increasing energy in the way Miami Art Basel had when it launched,” Johann Nowak, Director, DNA, Berlin. The Inescapable Truth (2005) by Damien Hirst, sold by White Cube for £1.75 million. The Inescapable Truth (2005) by Damien Hirst is the first formaldehyde work by the artist to be shown in China. Green Wall – Husband and Wife (2010) by Zhang Xiaogang, sold by Pace Beijing for US$1 million. More Light (1988) by Sean Scully, sold by Galerie Lelong for US$750,000. Untitled (2010) by Anish Kapoor, sold by Lisson Gallery for £550,000. Composition with Bamboo and Grass (2007-08) by Liu Ye, sold by Sperone Westwater for US$650,000. 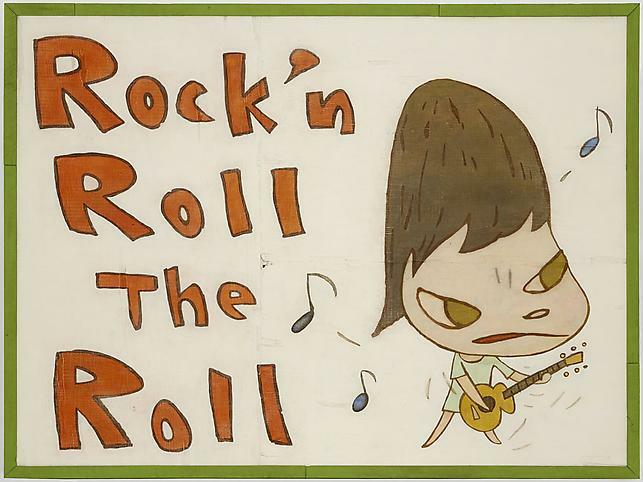 Rock’n Roll the Roll (2009) by Yoshitomo Nara, sold by Marianne Boesky Gallery for US$350,000. Gallerists and dealers had a mostly positive response to this year’s fair and what they had to say seems to mirror the high sales figures reported. “The response to our solo exhibition by Liu Ye exceeded my expectations. Sales were made to new collectors from Hong Kong, China, Indonesia, and Singapore and to a prominent New York collector. There is so much positive energy here. We look forward to returning next year,” David Leiber, Director and Partner, Sperone Westwater, New York. “We’ve met some very interesting collectors from other countries in Asia. The level of sophistication and interest in Western art is rising exponentially in Asia,” Ben Brown, Ben Brown Fine Arts, Hong Kong and London. Two year old gallery Fabrik, known for its unique guerilla exhibitions and for bringing Western iconic artists to Asia, sets up permanent home in Hong Kong. The Fabrik Contemporary Art Gallery is young in Hong Kong, having exploded onto the art scene about 2 years ago with its first show LOVE ART, which caused a sensation introducing works by the notorious street artist Banksy, who had never before been exhibited in Asia. Although the Fabrik Gallery is young, it stands out in Hong Kong’s Chinese-saturated art market for its rare support of Western and contemporary pop artworks and its unique practice of holding ‘guerilla exhibitions’ in temporary or borrowed spaces. In fact, 2 years into its business of promoting art, Fabrik Contemporary has just recently found itself a fixed home in the heart of Central in Hong Kong. The gallery is a joint venture, owned and operated by Sean Coxall, Jurgen Abergas, and Mark Saunderson, and was originally intended as a platform for the art enthusiasts to share and market their ever-expanding private collections of Warhol and other iconic pop artworks. The business partners recognized the void of popular Western artworks within the Hong Kong art market, which generally does not expose art lovers to Western phenomena. The gallery’s flagship Banksy show in April 2008 shocked the art community with its overwhelming success, drawing unprecedented crowds and attention. 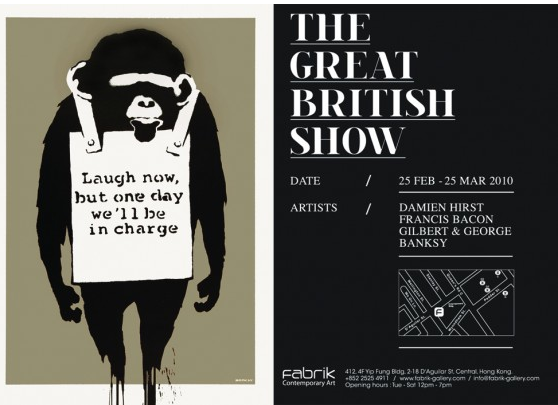 This Spring, Fabrik fittingly celebrated the opening of their permanent space with another show featuring Banksy, accompanied by the likes of Damien Hirst, Francis Bacon, and Gilbert & George in ‘The Great British Show,’ which ran February 25-March 25. Art Radar catches up with the Fabrik Gallery’s lively co-owner and curator Jurgen Abergas, a London-educated cosmopolitan whose background includes growing up in the Philippines and living in Los Angeles and China. He shares his perspective on the Hong Kong art scene, Hong Kong’s reaction to Western pop art, and tells all about the series of serendipitous events that culminated in bringing Banksy to Hong Kong. Was it logistically easy to have the Banksy LOVE ART show in Hong Kong? Yes, it was actually, because there is no tax on importing art here. We were not yet even registered as a company at that time. We were just working as a private dealership. We collaborated with the Schoeni Gallery, because [the Gallery Director] Nicole Schoeni loves Banksy and wanted to bring him here too. This was also a jump starting point for Nicole’s Adapta Gallery project in Hong Kong. The show was comprised of 3 days in the Hong Kong Art Centre, and then another 2 weeks with additional pieces for the Schoeni show. What is the mission of the gallery? The mission of the gallery is to encourage first time collectors. We try to provide known iconic pieces that accurately represent the style of an artist. For instance, if you want a piece by Hirst, you wouldn’t want a piece that is only a squiggle or a dot, because that is not a known Hirst. We show work that is more iconic and familiar. 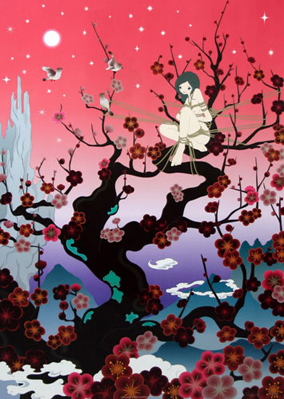 Japanese Apricot 2, 2005, by Chiho Aoshima. 55 x 77.8 cm Lithograph. Contact Fabrik Gallery. What type of art did you intend to share with Hong Kong? Definitely Western contemporary art. The Japanese art was not a fluke; I’ve been into manga since I was a kid, and it was something that my two partners only got eventually. We were at a gallery showing of Murakami and other artists, and I told them we should definitely show Murakami. I mean, we go to London, New York, Los Angeles, and we see all these [Murakami] retrospectives, but we don’t see it here. I thought it would make a difference in the Hong Kong arts scene if someone showed works of Murakami here. And also, we wanted to prove that what Murakami does is beyond just Louis Vuitton. When we opened this gallery, it was supposed to only be a stockroom. But, I said, let’s just do it properly. We were just kind of sick and tired of showing art out of our homes. It’s not ideal, but there are many dealers in New York and London that show art out of their home. However, in Hong Kong it is so crazy outside that you really need your home to be sacred space. So, we launched the Murakami show, and we pre-sold most of the art before hand! It was one of those shows where we were struggling because clients wanted their art immediately and not wait until the end of the show! So, we were re-hanging stuff that wasn’t even Murakami anymore, because we ran out of the pieces that were actually in demand. We didn’t see that coming at all. Nobody was specializing in Murakami in Hong Kong. However, I have to credit Nicole [Schoeni], because she had works by Chiho Aoshima, who is another artist by Murakami. Aoshima is a lady who just paints women. Nicole had an amazing Japanese apricot lithograph. It is a piece that is really stuck in my head. After seeing that, I was like, ok, let’s include other artists with Murakami. How is the Fabrik Gallery unique among galleries in Hong Kong? I think we’re unique because we deal with art that is not generally represented in Hong Kong, and we do not deal with Chinese art. I love Chinese art, but in a sea of contemporary Chinese art, there is only so much you want to see. We are looking to offer something different. We also think it’s important to educate the viewer of the message behind the piece. You can go to galleries and think a work is beautiful, but not understand the inspiration for a work. We support more people, especially students, coming into the gallery and reading about an artwork so they do not have unprocessed thoughts about art. When you have a guide to read or someone who will explain the art to you, it really makes a difference and makes a lasting impression on someone who visits the gallery. Can you describe the Fabrik Gallery’s ‘guerilla’ approach to art sales? Basically, we went to different venues, like the W Hotel, rented out space, painted it, put up lights, and showed our works there. Which galleries and arts organizations do you work closely with? We work closely with White Cube in London, Aragon Press (the publisher of Damien Hirst), Other Criteria (again, Damien Hirst.) Hirst is our specialty. Also KaiKai Kiki, which is Murakami, the Helium Foundation, and other galleries in New York for our private collections. Do you attend art fairs? Are you participating in Art HK? This May we will be. We’re going to Art HK. One of the reasons we did the Banksy show is because we were rejected from Art HK in 2008. We were accepted this year, but we’re still deciding whether we should go. They prioritize the international galleries and we notice that most of the galleries here in Hong Kong are not participating. I’m not exactly sure why, but it’s a very weird process. Although we were rejected the first time, it’s the best thing that ever happened to us. If we had done Art HK, the Banksy show never would have happened. What was your impression of Art HK? I love Art HK. It’s a great way to see art! I think it’s one of those events that can give a platform and democratize the buying of art and make international artworks accessible to a wider audience. However, I don’t approve of hard sales tactics, and showing artworks without providing the context of the artist. In art fairs in general, it is hard to create the intimacy of an actual gallery. What was Hong Kong’s reaction to your flagship show featuring Banksy? It was phenomenal, they loved it. No other exhibition has ever graced the front page of the City section of the South China Morning Post. The turnout was around 1,000 people, and people from Christie’s and Sotheby’s were lining up. We had to hire security because it was just too packed. It was a very well publicized event that just happened in about 3 weeks. People usually plan this sort of thing 6 to 8 months in advance, and we did it in only 3 weeks. We worked around the clock, and were so tired afterward. Before we opened the Art Centre the next day, people were already lining up to see the show. It was a combination of both local and expatriate people, which is good. I think people in London and Europe are more passionate about these things, though. It’s weird, because when we opened the Banksy show, Banksy-style art of monkeys appeared on the bridges, and the next day it was already erased. A lot of people thought the graffiti was actually authentic Banksy. If this was in London, they would have preserved that. If it was in New York, they would have preserved it. But here in Hong Kong, it was wiped the next day. The government needs to promote more sensibility toward the arts, especially here in Hong Kong Island. We’re on the cusp; we’re still not there yet. The Hong Kong crowd still has a lot to see compared to London. However, we’re never going to be London and we need to make our own niche in Hong Kong, and make a city where art and commerce blend in. It’s still a financial city; that is what we are all about. We are not exactly an art city. That is one of the disadvantages of being here in Hong Kong. We are not exposed to a lot, and important art can get erased the next day by the cleaners. Because it’s not important to them. Has Banksy been featured in Asia prior to your first show? We definitely wanted Banksy to be our first show. It is the first and largest show of Banksy in Asia; Tokyo rejected it, so we were glad to take it. Ironically, now Tokyo is hungry for his works. Does the Fabrik Gallery intend to feature other street or urban artists? 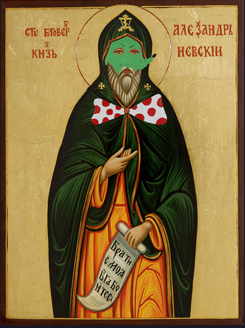 Paul Insect, Icon 8, 2008. Wooden panel, gold leaf, natural powder paint, shellac, acrylic paint. We are planning to bring Lazarides U.K. artists Antony Micallef and Paul Insect before the end of the year. We love their works and they relate well to Warhol, especially Paul Insect. He creates appropriated images that reference historical art. How does Banksy promote his art if his identity is kept secret? Does he directly work with galleries for his shows? He’s not with his manager Steve Lazarides anymore, since they had a falling out. They had different intentions; it’s hard when you’re turning art into a commodity. Banksy doesn’t work directly with galleries either, and doesn’t show up in exhibitions. He just wants his identity to be secret and to keep a low profile, and to continue creating smart work and churning out really good stuff. Why do you think Banksy created the sensation in Hong Kong? His works confront a lot of issues and are very tongue in cheek, yet also is close to the heart. Banksy’s art talks to each individual and is easy to relate to. It makes you think, but it makes you smile as well. Do you see any major differences between the art of Banksy and the art of the other artists in the ‘Great British Show’? His work, whether it is rendered in canvas or in print, is from the street. There is a roughness that you can see and feel, although it is a screen print. It is still raw, and there is something sinister about it. You know the artist made this on the street in the middle of the night and ran away from the police, knowing he could get caught at any time while he was painting. Are you familiar with the street art scene and artists in Hong Kong? If so, who would you consider important artists? I am familiar with Hong Kong street artists, like the ST/ART Collective… However, in general the street scene in Hong Kong is not very prolific. Funnily enough, I saw a tagging by the U.K. artist Word to Mother on a wooden board in the market. I am sure that it’s his authentic tag, since no one else can really do that. Someone just used the board to cover the fruits they were selling. Do you view Hong Kong as an international art hub? With Art HK, the success of ArtWalk, and the international galleries— The Gagosian Gallery is coming, Ben Brown is here, and the Malborough Gallery is opening here. Obviously people are looking at the potential of Hong Kong, and there is a big market here. Tsang Kin-Wah, 2006. Untitled wallpaper detail for Shu Uemura in California. What is great about the local art scene? There are particularly 2 artists that I really like. One is Tsang Kin-wah. He was commissioned to create the wallpaper of The Pawn restaurant in Wan Chai. He made repetitions of words to create a flock wallpaper pattern. He has had exhibitions in New York, Paris and Norway. He’s really a major artist, but he’s very humble. 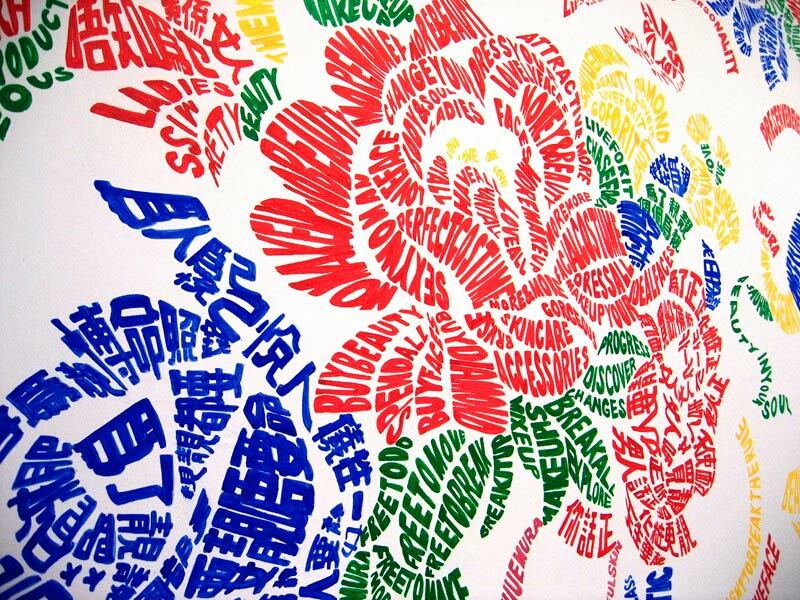 Nadim Abbas is another Hong Kong artist who used to work for Plum Blossoms, and is now showing his art at Para/Site. He’s a very conceptual artist, and was featured in the [Hong Kong Museum of Art] Louis Vuitton show representing Hong Kong artists. I love artists who work from their stream of consciousness, and he obviously does this. I also like the illustration style of Carrie Chau, [featured at the Wun Yin Collection Gallery] at the Homeless boutique on Gough Street. What news sources do you read to stay informed about the art world? Art Observed.com is my number one resource. The Art Newspaper is good too, although I’ve noticed that not all their stories are up to date. Sometimes their news seems to be relevant to say, 1o months ago. I also read Frieze Magazine, The Art Review, The Guardian, blogs, anything! What advice would you give to someone looking to start a dealer gallery in Hong Kong? Show only the artists that you love and the artists that you’re passionate about. Art is a very personal thing, and the general public may come in and hate it. Be prepared to be judged. Is there any particular information, news, or advice you would like to share with our readers? Start collecting now. If you like something, save your money and make it your goal. In the next few years you will probably regret not getting it. What is your next show at Fabrik Contemporary Art? In the Name of Pop, featuring Jeff Koons, Andy Warhol, and Keith Haring will run May 6-June 10, 2010. Visit Fabrik Contemporary Art’s new and permanent home at 412, 4F, Yip Fung Building, 2 – 18 D’Aguilar Street, Central, Hong Kong. The inaugural Abu Dhabi Art fair opened to much fanfare on November 19th. The government-run Tourism Development and Investment Company (TDIC) organized the fair, along with the area’s new cultural district on Saadiyat Island. The project features the Guggenheim Abu Dhabi by architect Frank Gehry, the Louvre Abu Dhabi by architect Jean Nouvel, the Performing Arts Centre by architect Zaha Hadid, the Maritime Museum by architect Tadao Ando, and the Sheikh Zayed National Museum by architect Foster + Partners Ltd. In attendance at the event were big time players from the Western art world, including London’s White Cube, New York’s Acquavella Galleries, and Dubai’s Third Line and B21. 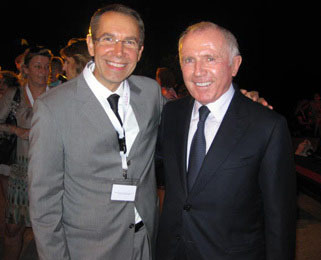 Megacollector François Pinault along with Jeff Koons were in attendance as special patrons. Jeff Koons on left, François Pinault on right. 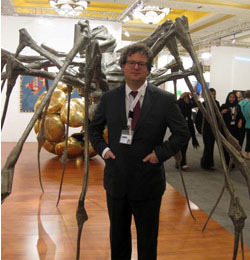 According to ArtForum who covered the event, Abu Dhabi Art was really two fairs under one roof. On the one hand, there was a slew of young galleries from places like Bangalore, Damascus, and Dubai, showing works that ranged from calligraphic kitsch to more promising endeavors. The other fair was a higher-stakes arena, featuring major New York and European dealers. Hauser & Wirth brought a large Louise Bourgeois spider sculpture and Subodh Gupta skull, while White Cube offered sparkling paintings by Hirst. Tony Shafrazi hung his ’80s-themed stand with Basquiats, Warhols, and Harings. A consortium of seven dealers, including L&M Arts, Malingue, and Louis Carre & Cie, combined forces with Picassos and Légers. Zhang Huan is known for his performance acts of physical and psychological endurance. This time, however, he left that act up to a couple of pigs. Zhang’s first exhibition Zhu Gangqiang at the White Cube Gallery in London (to October 3rd 2009) featured two live pigs in a make shift pigpen. The pig duo were intended by Zhang to stand in for a remarkable pig in China that survived for 49 days under debris after the 2008 Sichuan earthquake that killed more than 60,000 people. Now known as the “Zhu Gangqiang” or “Cast-Iron Pig”, the rescued pig has subsequently achieved celebrity status in China for its miraculous tale of survival. For Hudson, the highlight of the show was Zhang’s depictions of the rescued pig made out of burnt incense rather than the live pigs in the pigpen-utopia (where the pigs appear to have plenty of straw, a football and tire to play with, and exotic plants to eat). Sewell’s review describes Zhang’s remarkable and prolific history of performance art works and details the symbolic force they have had on audiences. He emphasizes Zhang’s mystical mastery of his work and goes so far as to berate the Tate Modern for not yet having acquired any of Zhang’s work for their permanent collection.